Download "An Efficient Filter for Denial-of-Service Bandwidth Attacks"
3 Table 1 Table 2 Table 3 Example: into the system: (1) rate monitoring algorithms, (2) certainty thresholds, and (3) multi-protocol tables. Rate monitoring algorithm - We require an on-line algorithm to estimate the incoming and outgoing packet rates (P in and P out ) for the addresses corresponding to each table entry. We have used an exponentially weighted moving average scheme (EWMA) to estimate these rates. For a given table entry, let M in represent the number of packets that have arrived in the time interval W for addresses that are hashed to this table entry. We update P in as follows: Table P in = αm in + (1 α)p in where 0 < α < 1. Fig. 1. Example of TOPS table showing entries for IP address attacks. Our aim is to provide a simple, static monitoring structure that requires little computational overhead even when an attack occurs. III. THE TOPS MONITORING SCHEME Our monitoring scheme called TOPS is implemented as a set of fixed length tables. Each table T i, i = 1 N, is indexed by a separate hash function h i (A), where A is an IP address to be monitored. Each entry of a table contains two counters that are used to monitor the flow rate of the addresses that are mapped to that entry, i.e., T i (h i (A)).P in records the incoming rate and T i (h i (A)).P out records the outgoing rate. Each time a packet arrives for address A in the monitored network, we update T i (h i (A)).P in for i = 1 N. Similarly, when a packet leaves from address A, we update T i (h i (A)).P out for i = 1 N. This indexing scheme is similar to a Bloom filter , where an object is indexed using multiple hash functions. Although many addresses are mapped to the same entry in any one table, no two addresses are mapped to the same entries in all N tables. This approach requires far less memory than a complete map of the IP address space. It also uses a fixed memory allocation, which means that no dynamic memory management is required, and there is no risk of the TOPS data structure becoming the victim of a memory exhaustion attack. In practice, we use N = 4 tables, each with 256 entries. The i th hash function uses the i th octet of the IP address to index T i. Figure 1 shows an example, highlighting the table entries that correspond to the IP address TOPS is used to detect attacks by testing whether the traffic ratio for a given address is abnormal, i.e., R(A) > R max for victim-oriented mode or R(A) < R min for attackeroriented mode. An attack is flagged for an address A if at least K table entries for A indicate an abnormal traffic ratio. As a default, we have used K = 3. If a packet arrives to a monitored address in victim-oriented mode, and at least K tables indicate an abnormal traffic ratio for that address, then the packet is dropped. Similarly, packets from a monitored address in attacker-oriented mode are dropped if at least K tables indicate an abnormal traffic ratio. In order to ensure the accuracy of TOPS, several key features have been incorporated An equivalent expression is used for P out. Certainty threshold - An abnormal traffic ratio should only cause packets to be dropped if either the incoming or outgoing packet rate is very large. If the traffic rate is low, then an abnormal traffic ratio can be caused by random fluctuations in traffic. Consequently, we maintain a cumulative distribution of the probability of different packet rates to or from the target network. If the probability of the packet rate being greater than the current level x is less than a certainty threshold θ, then packets can be dropped, i.e., if P r(p in > x) < θ. Multi-protocol tables - So far we have a single set of tables to record the incoming and outgoing packet rates for all types of traffic. As mentioned earlier, many attacks involve only a single type of traffic, e.g., TCP, UDP or ICMP. By using a separate set of tables for each protocol we can monitor the packet rate of each traffic type separately. This means that we can more easily detect abnormal traffic ratios for an attack that uses a particular protocol. We introduce 4 additional sets of tables corresponding to TCP, UDP, ICMP and other protocols. Each set of tables requires 32 bytes/entry and 256 entries/table for 4 tables, which is a total of 32 kbytes. If we keep 4 sets of tables in order to monitor each protocol separately, then we require 128 kbytes. In addition, we require memory for the cumulative distribution of packet rates, which is used in testing the certainty threshold. If we use a single distribution for all traffic types, then we require 8 kbytes of memory to gather statistics for the distribution. If we maintain a separate distribution of packet rates for each protocol, then we require an additional 32 kbytes of memory. IV. EVALUATION We have evaluated our TOPS monitoring scheme using packet traces from the DARPA 1999 Intrusion Detection dataset . This dataset provides labeled examples of different types of attacks in a test network that also carries normal traffic. Our aims are to investigate the accuracy of the flow imbalance heuristic for detecting DoS bandwidth attacks, and to test the effectiveness of our TOPS monitoring scheme as an implementation of the flow imbalance heuristic. In particular, we have evaluated (1) the accuracy of the flow imbalance heuristic, (2) the effectiveness of single vs multi-protocol TOPS, (3) the effectiveness of certainty thresholds, and (4) the analysis speed of TOPS. 5 TOPS when certainty thresholds were used and traffic was monitored by protocol. 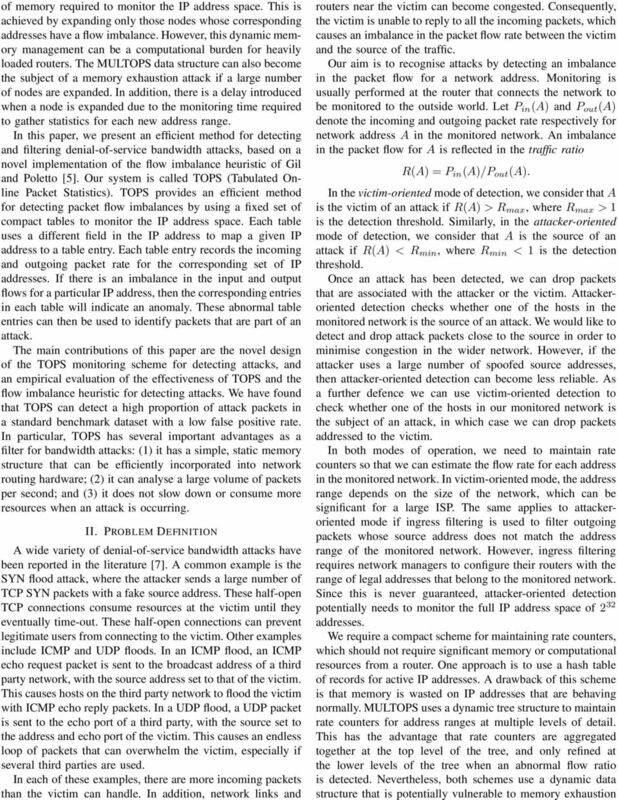 When TOPS is used in victim-oriented mode using multiple protocols, we measured an average processing speed of 527,000 packets per second using certainty thresholds, or 670,000 packets per second without certainty thresholds. 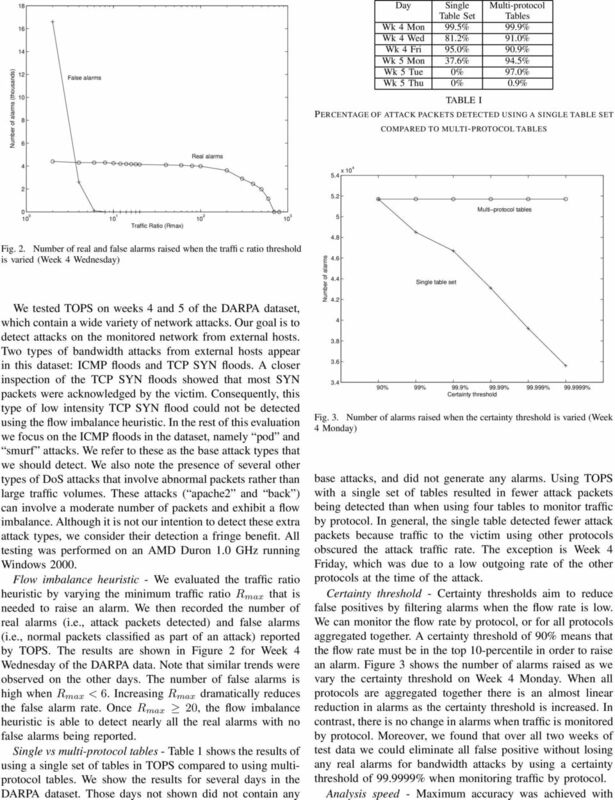 If TOPS is used in both attacker and victim modes, then the average processing rate was 334,000 packets per second. Since we did not have an implementation of MULTOPS, we cannot make a direct comparison. However, MULTOPS was reported to process around 270,000 packets per second in victim-oriented mode using aggregated traffic monitoring. V. CONCLUSION In this paper we have presented a novel system based on the flow balance heuristic to detect and filter DoS bandwidth attacks. In particular, we have shown how a form of Bloom filter based on a static tabular memory structure can efficiently detect attacks using few computational resources. We have also shown how we can improve the accuracy and reduce the false alarm rate of our system by monitoring traffic by protocol, and maintaining a probability distribution of traffic flow rates. The efficiency and accuracy of TOPS makes it highly suited for implementation in routers. As an issue for further research, we intend to investigate how TOPS can adapt to changing traffic flow rates according to time of day, as well as for different network hosts. VI. ACKNOWLEDGEMENTS This work was supported by the Australian Research Council. The permission of the Chief Technology Officer of Telstra Corporation Limited to publish this paper is hereby acknowledged. K. Kendall. A Database of Computer Attacks for the Evaluation of Intrusion Detection Systems. Master s Thesis, Department of Electrical Engineering and Computer Science, Massachusetts Institute of Technology,  R. Lippmann, et al. Analysis and Results of the 1999 DARPA Off-Line Intrusion Detection Evaluation. In Proceedings of the Third International Workshop on Recent Advances in Intrusion Detection (RAID 2000), pp  K. Park and H. Lee. 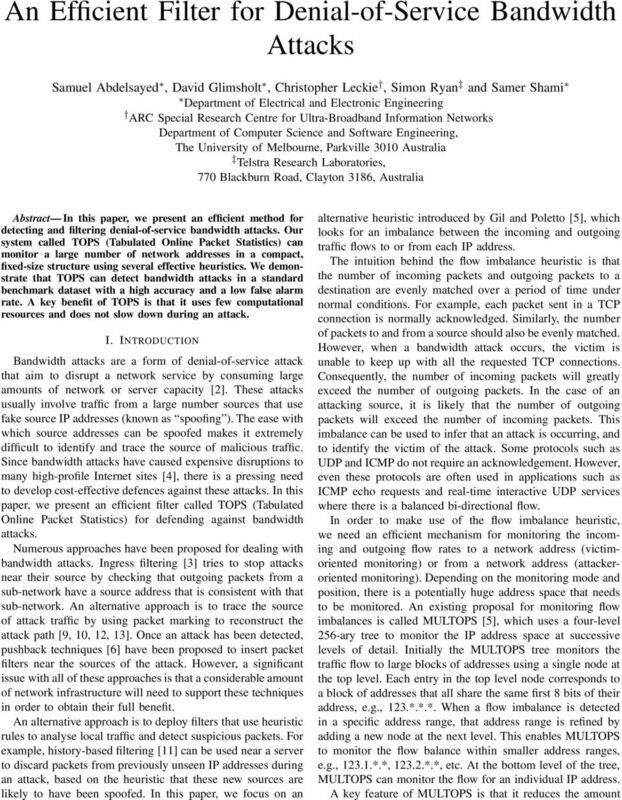 On the effectiveness of probabilistic packet marking for IP traceback under denial of service attack. In Proceedings of IEEE INFOCOM 2001, April 2001, Anchorage, Alaska, USA, Vol. 1, pp  T. Peng, C. Leckie and R. Kotagiri. 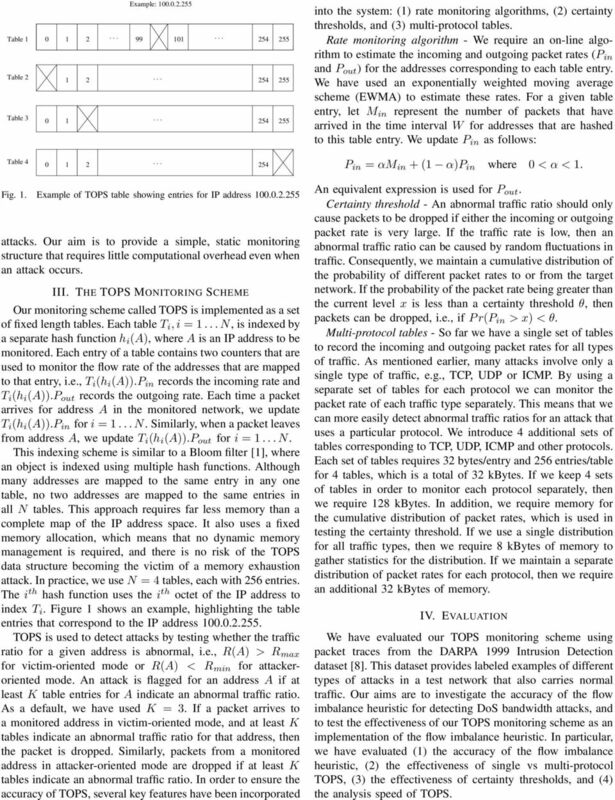 Adjusted Probabilistic Packet Marking for IP Traceback. In Proceedings of the Second IFIP Networking Conference (Networking 2002), May 2002, Pisa, Italy. T. Peng, C. Leckie and R. Kotagiri. Protection from Distributed Denial of Service Attack Using History-based IP Filtering. 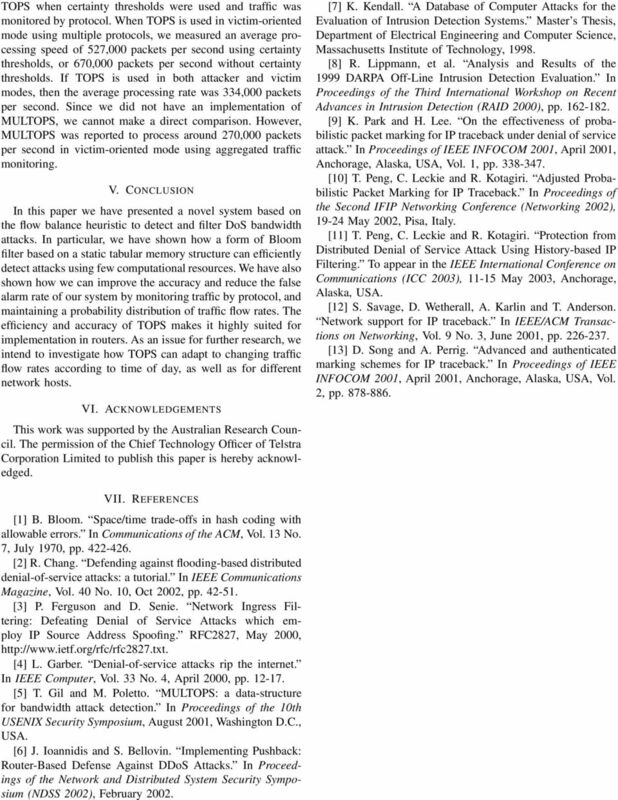 To appear in the IEEE International Conference on Communications (ICC 2003), May 2003, Anchorage, Alaska, USA. S. Savage, D. Wetherall, A. Karlin and T. Anderson. Network support for IP traceback. In IEEE/ACM Transactions on Networking, Vol. 9 No. 3, June 2001, pp  D. Song and A. Perrig. Advanced and authenticated marking schemes for IP traceback. In Proceedings of IEEE INFOCOM 2001, April 2001, Anchorage, Alaska, USA, Vol. 2, pp VII. REFERENCES  B. Bloom. Space/time trade-offs in hash coding with allowable errors. In Communications of the ACM, Vol. 13 No. 7, July 1970, pp  R. Chang. Defending against flooding-based distributed denial-of-service attacks: a tutorial. In IEEE Communications Magazine, Vol. 40 No. 10, Oct 2002, pp  P. Ferguson and D. Senie. Network Ingress Filtering: Defeating Denial of Service Attacks which employ IP Source Address Spoofing. RFC2827, May 2000,  L. Garber. Denial-of-service attacks rip the internet. In IEEE Computer, Vol. 33 No. 4, April 2000, pp  T. Gil and M. Poletto. MULTOPS: a data-structure for bandwidth attack detection. In Proceedings of the 10th USENIX Security Symposium, August 2001, Washington D.C., USA. J. Ioannidis and S. Bellovin. Implementing Pushback: Router-Based Defense Against DDoS Attacks. In Proceedings of the Network and Distributed System Security Symposium (NDSS 2002), February 2002.